Well, as you’ll see from the last POM, India was on the agenda in October. For me this was a totally different experience from the normal DIY masochism that now seems to be the norm for my photographic excursions. This time I joined mountainbikekerala for their guided 12 day odyssey into the Indian Himalayas, something I was worried might be a tad tame. No need to worry there. In fact my biggest concern on the first day was how the hell I keep up with world champ Trek/Endura pro Tracy Moseley, James Richards and Phil and Lucy who run bikeverbier, out on a busman’s holiday. The trip, although guided, included enough gnar’ to make you feel you earned every foot of descent (of which there was a lot), riding what seemed (although cliched) endless singletrack through steep, forested foothills into the high mountains up to 3800m at Zero Point. Technical, flowy, paved, steep, hike-a-bikes… the trail delivered everything, including monkeys swinging above our heads. Go there. Ride it. 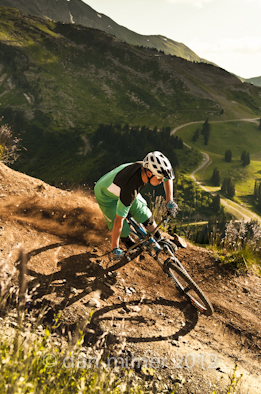 And so while I was there to shoot on my trusty Leica M9, rather than film (we had an ace Indian rider/filmer/pinch-flat master, Vinay, with us for that purpose) I managed to squeeze in a a day of Go Pro’ing to make this little (tongue in cheek) glimpse at the upper end of the trail. 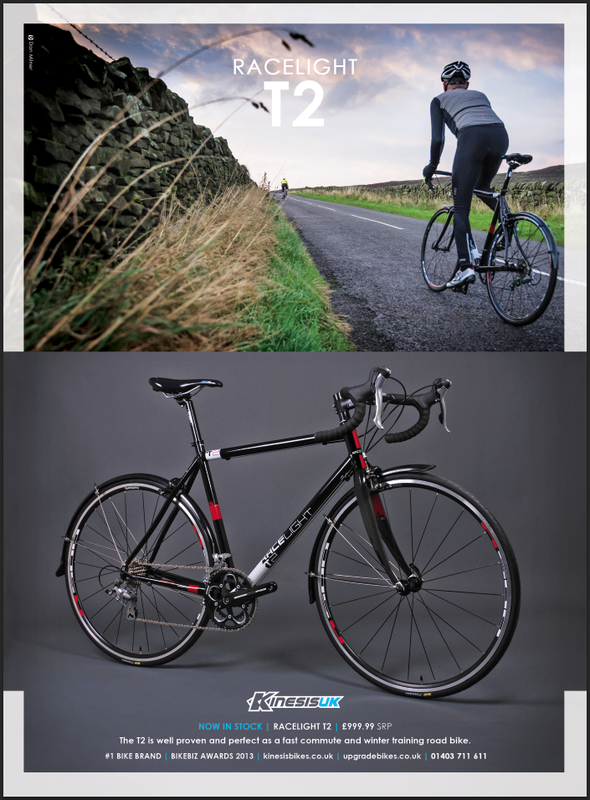 The story will appear in print in MBUK and Bike Germany in the spring. But until then.. enjoy this little taste of India. Riding the Pindari Glacier Trail, India from danmilner on Vimeo. It’s been a while in the making, 19 years in fact. 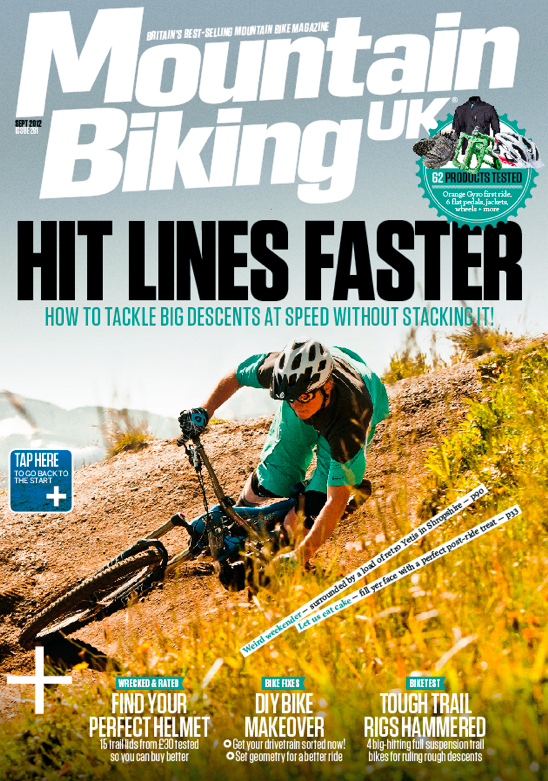 MBUK was the first mountain bike mag I started working with some 19 years ago (with a self-shot riding feature on Mallorca called “Sizzle”), and this month I landed my first front cover on the mag. I’ve had other covers -on Bike, on Singletrack, MBR, Privateer and What Mountain Bike- but MBUK has always eluded me. Until now. A lot of this has to do with style. 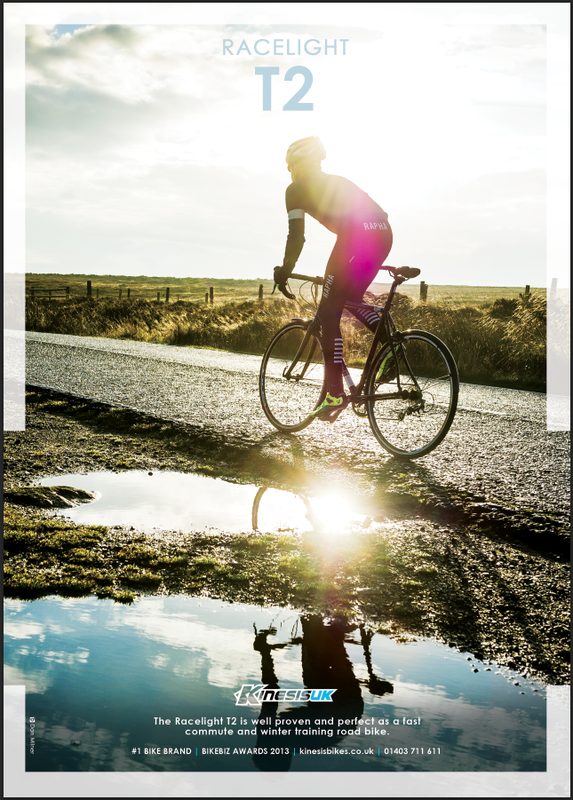 As you’ll no doubt know, I’m not one for using flashes unless I have to (odd as I spent all last week at Eurobike burning my flashes into meltdown), preferring to work with natural light, and to cut a long boring story short, for years MBUK’s covers have always been about flash. They’ve also been about bikes, specific bikes and politics and wanting a certain bike, a certain colour clothing on the cover, all to do with relating to inside content (and dare I say it, keeping advertisers happy). But last year they had a redesign one that opened up their cover look to, well more Milner-like flash-free photography. This shot of Mark Scott was taken during a very long day shooting a technique feature in the Portes du Soleil area. “Just see if you can get us a cover while you’re shooting the feature,” had said the art director. Hmm, yeah we’ll see about that I thought, knowing full well most covers are shot on dedicated cover shoots. In the end we came across two cover-suitable bits of trail that fitted the “Fast and Loose” brief, one we sessioned for the above shot and just making the last lift to reach the second location before the lifts closed for the day. I’d expected the mag to use the shot below, part of the session at the end of the day, when the light started to ping, but it was the morning shot taken en route to the technique feature that made the cut instead. Maybe in 19 years time I’ll shoot flashed covers. We’ll see. If you’ve avoided keeping up to date on my roamings during 2011, you’re bang out of luck now. You’ve stumbled on my annual recap of this last year spent as a travelling professional photo chimp.. . a collation of images that I hope gives a kind of insight into the eclectic adventures that my dream job allows me to photograph in various corners of the world, and the reason that we photographer’s are *mysteriously moody/unbearably over confident/trembling nervous wrecks (*delete as appropriate). Canon EOS 1D mkIII, 24-70 2.8, f5 1/1000. (above) It’s all about the backside air. 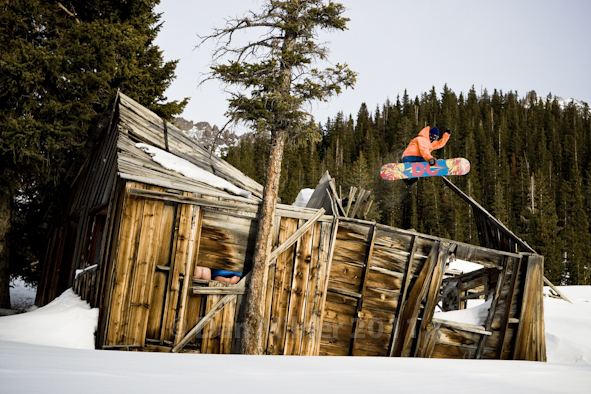 Nate Kern throws a backside air over old mining ruins near Telluride, Colorado, while two well-known but remaining anonymous female pro snowboarders couldn’t resist giving him cheek. The trip with Jenny Jones, Hana Beaman, Nate and Angus Leith was a reminder that snowboarding, a sport so many of us begun for fun, needn’t just be business. Canon EOS 1DmkIII, 24-70/2.8, f7.1, 1/800. (above) Kickers have never been my favourite thing to shoot in snowboarding, especially when there is powder to ride and shoot in the backcountry. It has something to do with how I ride. I’m not a kicker person and find shooting them a little dull and restrictive. A lot of standing around cheering other people on. Kickers, compared to freeride shots, seem more about the style of the rider than the art of the photography, at least normally. After ticking the rider’s boxes however this time I found time to satisfy my own art-urges. 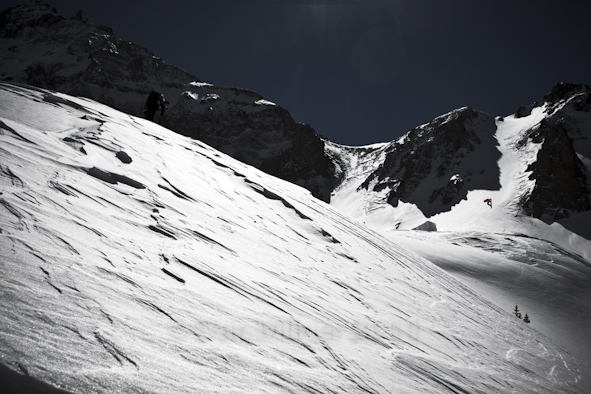 Nate Kern is in there somewhere, deep in the Telluride backcountry, Colorado. 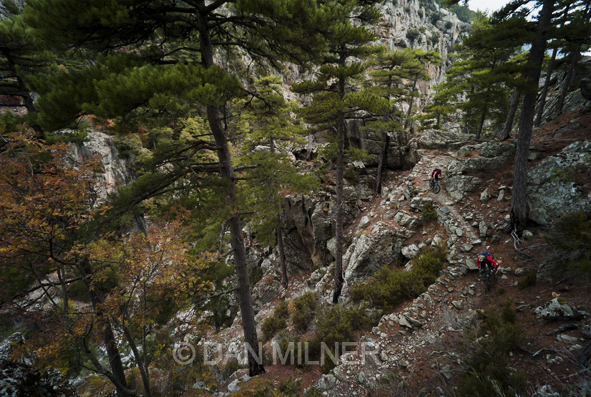 Photo Of the Month: Revisiting the Mar-e-mar north trail, Corsica. Seven years ago I rode this trail on my Titanium hardtail. Back then having 110mm of fork suspension was almost a luxury for us XC-riders and the four day point-to-point we attempted along this trail dealt us out a drubbing. Seven years later it was time to go back armed with our “everyday” rides -150mm travel Yeti 575 bikes. The trail, a long distance, rugged hiking path between coastal Porto and mountainous Corte, was as technical as I remember and more, but a whole lot more fun on these bikes, and dare I say it with hindsight and planning, especially when approached in the opposite direction to give us the net benefit of gravity. Deep in the beautiful forests of this Mediterranean island, we found ourselves alone with our bikes, riding trails that thread along some of the most spectacular gorges of Europe. This shot is deep in the Tavignano gorge, reached via a 700m climb and 300m tech descent. It runs via some 20Km of ancient paved mule track to Corte. The story is running in MBUK (UK) and Bike mag Germany in February.